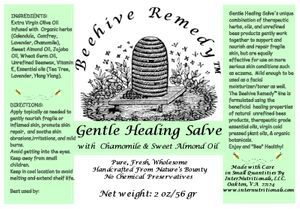 Gentle Healing Salve combines potent skin healing herbs with anti-inflammatory and antiseptic essential oils in a base of high quality plant oils, to gently nourish and support fragile skin, promote skin repair, and assist in healing minor abrasions, and soothe skin irritations. This salve is effective for use on more serious conditions such as eczema and rosacea, but mild enough to be used as a facial moisturizer or toner. The efficiency of this salve combined with it's pleasant scent of lavender and ylang ylang, have made it one of our best sellers! This product is available in a 1 ounce metal tin, handy 1/2 ounce twist up face stick, or 2 ounce twist up tube for application on larger areas of the body. 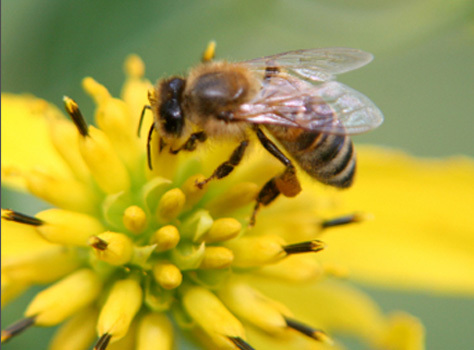 Bee Outdoors Skin Repair is an extremely nourishing formulation of aloe and avocado oils, infused skin repair botanicals, and potent essential oils. 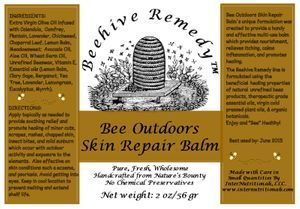 This handy and effective multi-use balm takes the itch and inflammation out of insect bites and mild sunburns, soothes and assists in healing minor cuts, scrapes, rashes, and soothes severely chapped or dry skin, which occur with outdoor activity and exposure to the elements. Great for gardeners, hikers, and outdoor enthusiasts, as well as those who suffer from extremely dry skin or chronic conditions of the skin, such as psoriasis or eczema. application on larger areas of the body. 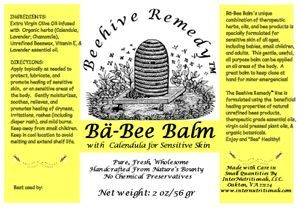 Ba-Bee Balm is a simple and effective balm formulated for babies, those with extremely sensitive skin, or for the sensitive areas of the body. Extra virgin olive oil is infused with select organic botanicals, enriched with Vitamin E, with a trace of lavender essential oil added. The combined result moisturizes, lubricates, soothes, and relieves dry skin, rashes, (including diaper rash), skin irritations, and mild burns. 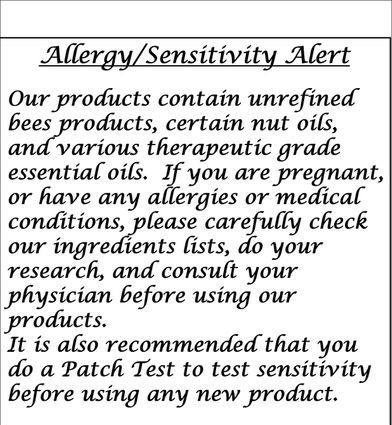 A wonderful and gentle balm for all ages and many uses! Available in a convenient 1 ounce metal tin, handy 1/2 ounce twist up face stick, or 2 ounce twist up tube for application on larger areas of the body. 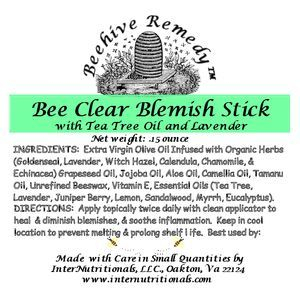 Bee Clear Blemish Stick offers a potent, concentrated, yet gentle formula which quickly heals & diminishes blemishes and cold sores, soothes inflammation, shrinks pores, smooths scarring, and skin tone. Use as a spot treatment on blemishes or as a general toner for the entire face. Invisible when applied, this popular balm can be used during the daytime or nighttime on clean skin. Try for several days and prepare to be surprised and delighted!